Cost to install a propane tank varies greatly by region (and even by zip code). Get free estimates from plumbers in your city. Cost to install a propane tank varies greatly by region (and even by zip code). 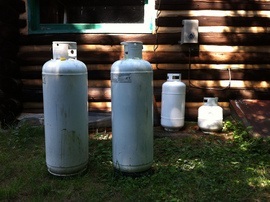 How much does it cost to install a propane 1 tank? Propane 1 tanks are most often used in domestic settings to supply appliances and household heating systems with the fuel required. The tanks come in a large array of sizes that can range from as little as 45 gallons and upwards of one thousand gallons. The fuel becomes a fluid when under pressure, and tanks can be safely kept both above and below the ground. The most common way that they are installed is in the above ground location, particularly because most are leased or rented from the propane 1 company. Most above ground installations have a very specific set of requirements that can include location of the tank and the need for local permits. For the purpose of this discussion we will look at the materials and costs for the above ground installation of a 150 gallon propane 1 tank at a residential site. A new meter will average around $70. Gas line fees will cost around $4 per foot installed. Before moving on, however, it is important to understand that most homeowners opt to lease their propane 1 tanks from their propane 1 suppliers. The most common leasing arrangements provide a no-fee rental on the tank as long as the homeowner commits to a minimum fuel purchase each year. When fees are attached to a tank, they will average between $75 and $130 per year. In almost all areas it is entirely illegal for one propane 1 supplier to fill a tank that belongs to another agency altogether. This means that it is up to a homeowner to ensure that they can rightly request the services of a supplier, and to contact the appropriate organizations when a tank is no longer required. 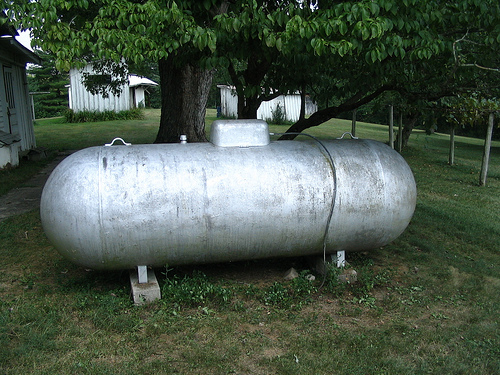 If a homeowner wanted to purchase a used propane 1 tank in order to save on rental fees or free them from obligations to an individual company, they must have any tank tested and certified by a local propane 1 dealer. This is a great way to obtain the best price per gallon on propane 1 because it doesn't "lock" the buyer into a single distributor. Generally, a representative of the fuel company selected for service will visit the site, ensure the new tank is going to be placed at an appropriate distance from impediments or buildings, and that the ideal size is selected for the homeowner's needs. This individual will then go over any special requirements for site preparation. 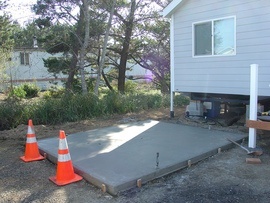 A concrete pad 2 to be poured to the dimensions necessary to support the tank selected. Concrete costs roughly $75 per yard (this is for the reinforced mesh 3 varieties), and a single domestic tank will rarely require the full yard. 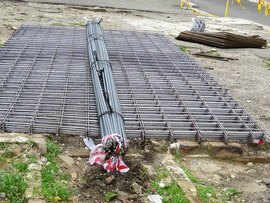 Forms and reinforcing mesh 3 may also be necessary for the project. Total time will be less than four hours, and costs will run at roughly $100. Digging of a yard line trench to code and to the specifications of the propane 1 supplier. Most will provide such services for a fee, but many homeowners opt to perform this relatively simple task on their own. This may, however, require the location of any buried utilities and also the rental of a trencher if the run is particularly lengthy. Most home improvement stores rent equipment for an average of $45 for half of a day. Room for delivery of the tank. Most propane 1 companies will require mechanical support to set the tank in place, and this means that the location for the tank must be close enough to the roadway to allow the vehicle or equipment to access the area. Once an installation is complete the propane 1 company representative will ensure that all appliance pilot lights are ignited and that the propane 1 tank regulator is operating correctly. It is at this time that the homeowner should make a point of reviewing contractual obligations, service arrangements, and propane 1 delivery schedules. How much does it cost to install a propane tank in my city? Cost to install a propane tank varies greatly by region (and even by zip code). To get free estimates from local contractors, please indicate yours. Material made of interlaced steel bars or wire, welded together, used to reinforce concrete.